Written by divers, for divers, the team at Asian Diver are proud to share penetrating and unique insights into some of world’s richest diving sites. With articles drawn from the diving world’s most accomplished underwater journalists, award-winning photographers and academics alike, Asian Diver seeks to grow a community committed to growing the sport we love so dearly, and fostering a deeper understanding of why we must preserve the natural beauty of our oceans. This magazine is for the serious diver who understands the lure of the deep blue. For novices seeking to be a greater part of the aquatic world, this content- rich publication will showcase profiles of the prominent movers and shakers of the industry, increase awareness in diving safety, get up close with the peculiar “natives” of the reefs and find out more about what else there is to do after you are certified. Working with the world's best underwater photographers and journalists, premier dive magazine Scuba Diver sets the standard by which all other dive magazines are judged. This magazine is for the modern diver who wants to discover everything they need to know about exploring our fascinating oceans, both in Asia and around the world. Travel destinations, where to find spectacular marine-life, what equipment you need, dive techniques plus news on discoveries and environmental issues - Scuba Diver has it all. 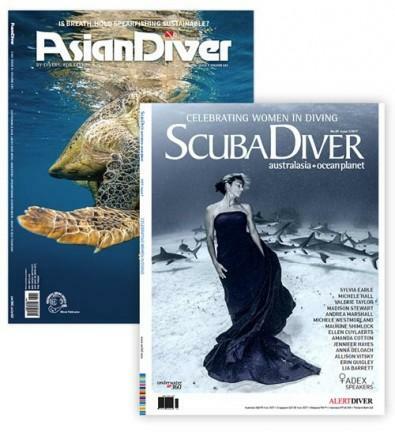 Scuba Diver Australasia and Ocean Planet are alternating titles with 4 issues each per year. While SD Australasia stays true to its roots with editorial coverage exclusively from the Asia Pacific region, Ocean Planet shines a light on top diving destinations from around the world; giving you lots of options for your dive bucket list both near and far. Be the first person to tell us what you think about Asian Diver & Scuba Diver Australasia and Ocean Planet Magazine and you'll save £2.50 on your next purchase!